Syndicate Lofts – The Dijk Family play the ‘Starring Role’ from Bourges…. Home › The Duif Chronicles › The Dijk Family play the ‘Starring Role’ from Bourges…. The Dijk Family play the ‘Starring Role’ from Bourges…. The Dijk Family play the ‘Starring Role’ from Bourges! The first One Day Long Distance N.P.O. 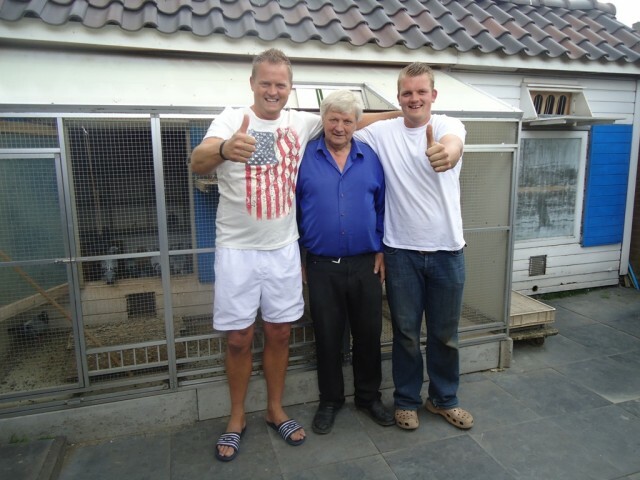 race of the season in Afdeling 5, South Holland took place last Saturday from Bourges , when a total of 16,923 pigeons were given liberated at 7 am. No one could have imagined that barely five hours later in Alblasserdam a pigeon fairytale would unfold. At round 5 minutes to 12 three pigeons arrived above this beautiful town. Then it soon became apparent that they belonged to all three of the Dĳk family. The 1st and 3rd winners were flown by father Theo and son Mike, and the 2nd position was won by other son Gero and wife Evelien. So, Father and two sons won 1,2nd,& 3rd NPO Bourges race! The winner is the NL12-160805 ““Gastelleke” a Rinus van Gastel hen from “Son Winner ” (Grandson Rocket) x “Granddaughter Rocket “. The runner up is NL13-1230632 “Yolanthe” which comes from “Super Crissie” (Koring-Bosua) x ‘Blue Cockerel “(Voets-Vermetten x Bosua).